Just east of Vincennes on US 50 lives one of the largest Amish communities in the state. Visitors and locals cruise through the backroads to discover a slower, more beautiful pace of life in Southern Indiana. The rolling hills, fields, and woods create the most picturesque sunsets and sunrises around. Many locals spend their time fishing, hunting, and camping in the serene parks and lakes. The area, home to a large Old Order Amish population, lends old-world charm. The community began in the late 1800s when Amish settlers came from Canada to Northern Indiana. 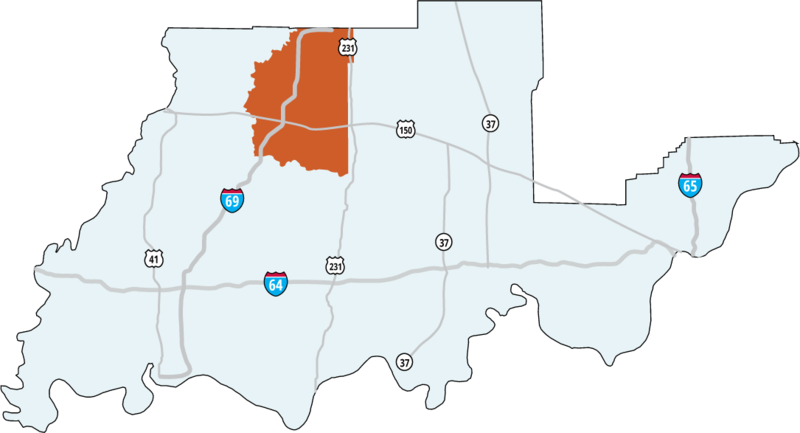 The settlers eventually went south to Daviess County. The Amish community is well-known for its artisan furniture, quilts, antiques collectibles, and recipes. Relax and take in the simple joys of life at one of the inns, greenhouses, flea markets, and events. Your getaway won’t be complete without sharing the road with a clip-clopping horse and buggy, attending the weekly Friday night auction, and settling in for a delicious family-style Amish dinner. Both the Amish culture and Southern Indiana down-home vibe welcome all visitors. Slow down and smell the fresh country air on the backroads of this community. The New White Steamer, near the Daviess County Museum, is an old-school diner serving up all-American classics. 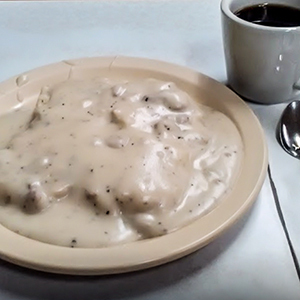 Biscuits and Gravy are a local favorite, but if you can’t decide, try the Breakfast Platter. As one of the newest restaurants in the area, Yolanda’s Bistro boasts fresh flavors inspired by food from Louisiana to Los Angeles. 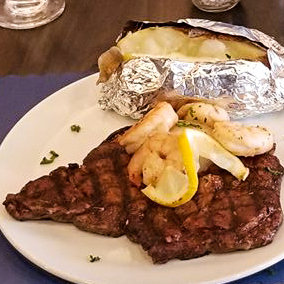 The Ribeye Steak is one of the most succulent around. Bobe’s Pizza Express is the go-to for hot, tasty pizza. 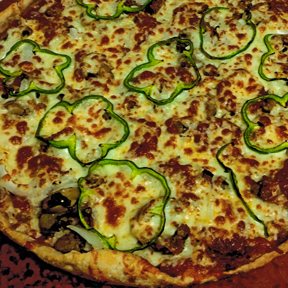 Their signature pie, The Farouk, is topped with sausage, pepperoni, mushrooms, onions, and green peppers. 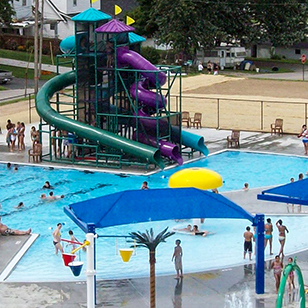 Cool off from the warm summer sun at Waterworld of Washington. The Amish community offers many great finds the region. 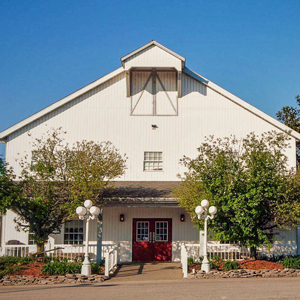 From handcrafted quilts and furniture to delicious buffets and bakeries, Gasthof Amish Village offers visitors a taste of culture. 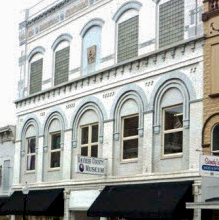 For local history, sports memorabilia, and even a large mortuary exhibit, head to the Daviess County Museum. The one-of-kind experience journeys through the history of the Gill family funeral business. 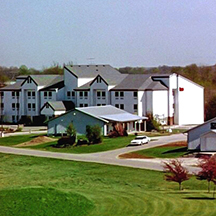 Gasthoff Inn sits in the middle of the Amish Community. Start the morning with a stroll through the Village and breakfast at the Gasthof Restaurant. 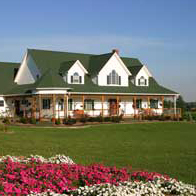 Within the rolling hills of Southern Indiana, Graber’s Green Gables Bed and Breakfast offers a slow pace and relaxing scenery. 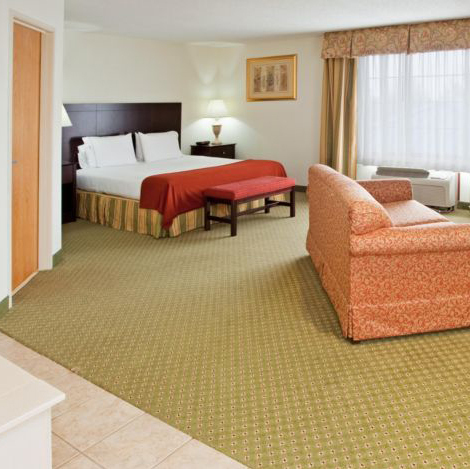 Holiday Inn Express in Washington boasts a comfy night sleep. Guests can enjoy a work-out room, pool, and continental breakfast. Whether you’re visiting for some relaxing outdoor recreation or getting a taste quiet Amish lifestyle, you’ll be welcomed to Hoosier Hospitality down home in Southern Indiana. On our next stop along US 50, we will find ourselves enjoying the great outdoors in Martin County.